Are there any convertibles in the Volkswagen lineup? You bet there is. 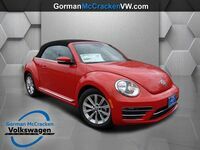 The 2018 Volkswagen Beetle Convertible is the perfect choice for those who admire the quirky and whimsical appearance of the model, but want the option to let loose when the sun is shining. This makes it an ideal option for shoppers in the Longview TX area, where there are plenty of rays to soak in. 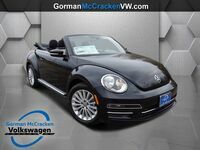 The 2018 Volkswagen Beetle Convertible is offered in a total of five trims, include the special edition Beetle Coast and Beetle Dune. This means there are plenty of options from which to select, but where does it all start? The base trim for the 2018 Volkswagen Beetle Convertible is the S trim. This means these are where all the most essential features can be found. All higher trims just sweeten the deal more with comfort, convenience, style and infotainment options. So what are considered base features? Remember that each and every Beetle Convertible for this model year will be mechanically the same. Under the hood is a 2.0-liter turbocharged 4-cylinder engine that is tested at 174 horsepower and 184 pound-feet of torque. This is paired with a 6-speed automatic transmission with Tiptronic and Sport mode. Remember, these are just the base features, so all higher trims offer even more. Find out what other features are available when you stop by Gorman McCracken Volkswagen for a test drive.